briannalynn/paper perspectives: and I shall keep you! Happy hump of the week day! It has been long days here. Hubby has been working long hours, leaving me to my babies, and than books at bedtime. Of course on my down time, I have been filling the hours with my paper and glue. 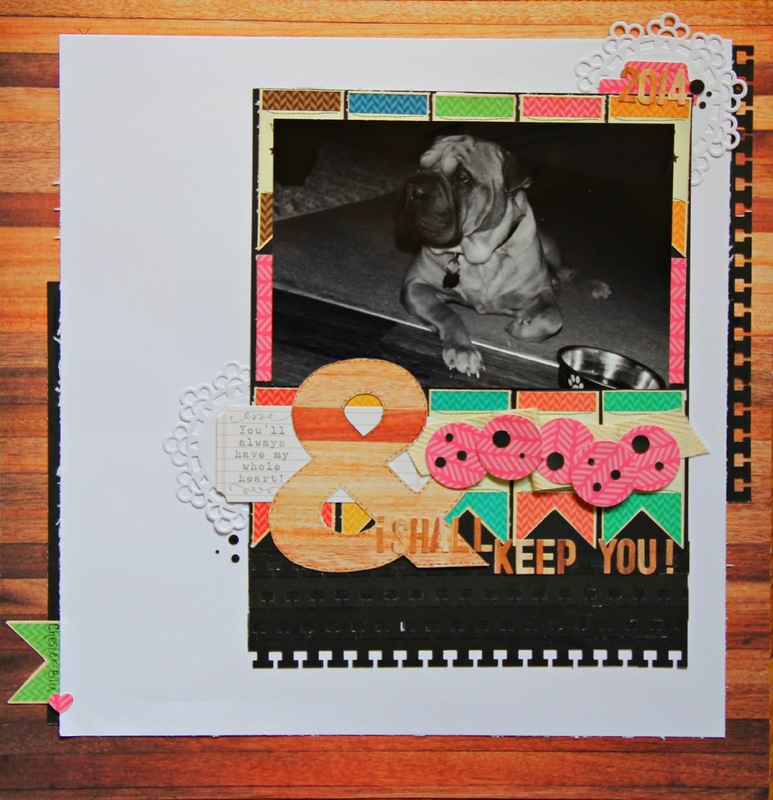 I created this fun layout to go along with this weeks sketch over at Elles Studio. I am not one to often scrap pets, but we captured this amazing photo of Chester-Bu and I just had to put it to paper. Those that have followed me for quite sometime now will remember this post of our previous pet, Sunnie, whom passed away suddenly. This layout became a beautiful thing for us as it was the only layout ever scrapped with her. I vowed to include our next pet more in my projects when the time came. Fast forward 2 years after her passing, we stumbled upon the cutest ball of wrinkles at the pet store and just had to bring him home. He is now known as the majestic lion, mountain goat, as he feels the need to climb on everything, to the highest peek. Quite the feat for such a large dog, if I do say so myself. So here is to Chester-Blu, my always slobbery, sometimes stinky, but ALWAYS playful and loveable beast of a dog! Ohhhhhhhhh I love love love this! LOVING the colors and how you framed the photo!!!!!!!!! ohhhh what a cute doggie!!!! cute page, love your layered borders!!! Awwwww, I already love him!!!!! stinky and slobbery ... lol!!! I know what you mean! LOVE your page! It's so colorful and I just love the title!! Pinning!